Greece isn’t actually for party, rather for pensioner’s holiday, but Greece has very nice party Islands, not only the well-known island of Lesbos of even Mykonos has much to offer. Mykonos is the party island for the students of Greece and many party people, there is a good atmosphere and people party without end. Country info: Where Europe and Asia meet, Greece forms the southernmost tip of the Balkan Peninsula in southeastern Europe. 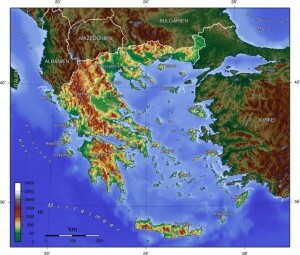 The territory of Greece includes over 2000 Islands in the Aegean and Ionian Sea, of which only approximately 165 are inhabited. Mount Olympus is the highest point of the country. Greece is one of the cradles of European civilization, and the Greek scholars of antiquity far advanced the philosophy, medicine, mathematics and astronomy. The City-States played a pioneering role in the development of democratic forms of Government. The historical and cultural heritage of Greece still holds meaning for the literature, art, philosophy and politics of the modern world. The Republican structure of modern Greece is based on the Constitution of 1975. The 300 members of Parliament consisting of only a Chamber are elected for four years. The country is divided into 13 administrative districts. More than half of the Greek industry is located in the greater Athens area; the most important economic areas of the country are agriculture, tourism, construction and shipping. The most famous personalities of Greece include the filmmaker Constantin Costa-Gavras, the Nobel Prize winner Odysseus Elitis and composer Mikis Theodorakis. Goat and mutton are essential components of the Greek cuisine. Also fish dishes are very popular. Olive oil, which is produced in large quantities in Greece, the Greek food gives a special taste.